Samut Prakan (Thai: ) is one of the central provinces (changwat) of Thailand, established by the Act Establishing Changwat Samut Prakan, Changwat Nonthaburi, Changwat Samut Sakhon and Changwat Nakhon Nayok, Buddhist Era 2489 (1946), which came into force 9 March 1946. It is part of the Bangkok Metropolitan Region. Neighbouring provinces are Bangkok, to the north and west, and Chachoengsao to the east. Suvarnabhumi Airport is in the Bang Phli district of Samut Prakan Province. The province was created during the Ayutthaya period, with its administrative centre at Prapadaeng. It was the sea port of Siam, and was secured with forts, town moats, and town walls. King Rama II started the building of the new centre at Samut Prakan in 1819, after his predecessor King Taksin had abandoned the town fortifications. Altogether six forts were built on both sides of the Chao Phraya River, and on an island in the river the pagoda, Phra Samut Chedi, was erected. These were involved in the Paknam incident of 13 July 1893, which ended the Franco-Siamese War with a French naval blockade of Bangkok. Of the original six forts only two still exist today, Phi Sua Samut and Phra Chulachomklao. 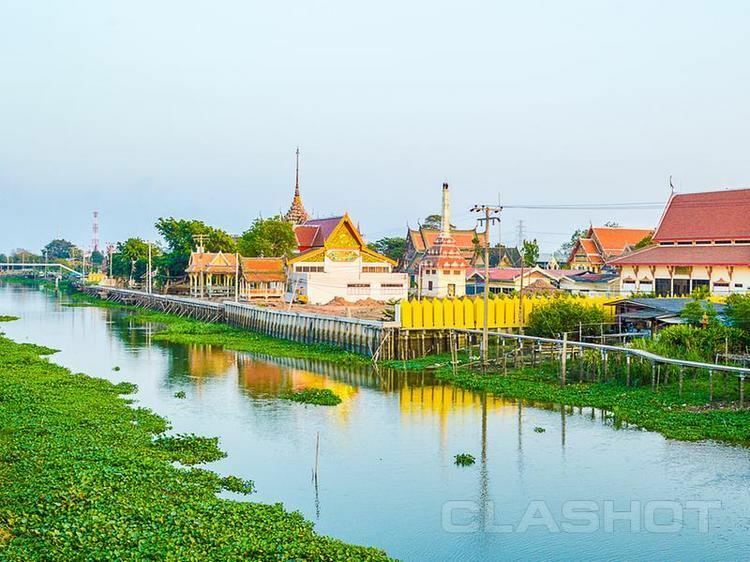 Samut Prakan is at the mouth of the Chao Phraya River on the Gulf of Thailand. Thus the province is also sometimes called Pak Nam (?????? ), the Thai word for the mouth of a river. The part of the province on the western side of the river consists mostly of rice paddies and prawn farms as well as mangrove forests, while the eastern part is the urban centre, including industrial factories. It is part of the Bangkok metropolis. The urbanization on both sides of the provincial boundary is identical. The province has a coastline of approximately 47.2 kilometres. Erawan Museum (?????????????????????) – The 3-headed elephant museum was constructed to house Mr. Lek Viriyahbhuns collection of art objects and antiquities and various other cultural heritage items for the benefits of younger generations. Naval Museum (??????????????????) – The museum exhibits historical information on the Royal Thai Navy and major naval battles in 2 buildings. Mueang Boran or the Ancient City (??????????) – It covers a total area of approximately 800 rai with miniatures of major tourist attractions such as Khao Phra Wihan, Prasat Hin Phanom Rung, Wat Mahathat, Phra Phutthabat, Phra That, Phra That Chaiya. 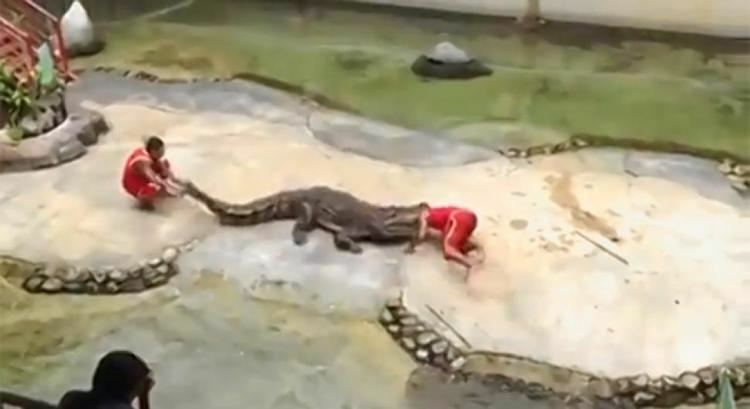 Samut Prakan Crocodile Farm and Zoo (??????????????????????) – It was established in 1950 and is at present the worlds largest crocodile farm, where more than 60,000 crocodiles of various sizes are bred. Wat Klang Worawihan (??????????????) – It is a second-class royal temple of the late Ayutthaya period. A mandapa or mondop was constructed to house "Phra Phutthabat Si Roi", the Four Buddhas Footprints, with a gable decorated with stucco reliefs and Bencharong crockery. Wat Asokaram (???????????) – As one of the provinces major temples belonging to the Dhammayut order (Thai Forest Tradition), it has many spots of interest such as Phra Thutangkhachedi (Dhutangachedi), a complex of 13 "chedis," or "stupas" which contains relics of the Buddha, and Wihan Wisuthithammarangsi (Vissudhidhammarangsi), a 3-storey building with 4 porches and a superstructure in the form of a mondop. A giant statue of the Indian Emperor Asoka is also worth mention. The temple was founded by the great saint Ajahn Lee Dhammadaro, whose remains are interred in a casket in the main temple hall. King Rama V the Great Monument (??????????????????? ?????????????????????????????????????) – A graceful monument of King Rama V the Great in the uniform of a naval general holding a sword in both hands. HTMS Mae Klong Museum (?????????????????????????) – The Royal Thai Navy warship with the longest service period of 60 years, now a museum. Naval Historical Park (???????????????????????????) – The exhibition building puts on display photographs of the destruction from fighting and development of the Royal Thai Navy. There is also an open exhibition of naval armaments and munitions. Phra Samut Chedi (??????????????) – The chedi was constructed at the command of King Rama II. The chedi contains Buddha relics and images of the Buddha pacifying the ocean and Phra Chai Wat. Bang Namphueng Floating Market (?????????????????) – The charm of this floating market is the canal side lifestyle of the community whose members are mostly Thai–Mon. Local products and famous foods such as hoi thot (fried mussel pancake), khanom khrok or mortar-toasted pastry, are sold. City Pillar Shrine (???????????????????) – The city pillar holds a distinctive aspect in that it has an image of the God Ganesha on top. Phra Suea Mueang Shrine (????????????????) – At Tambon Talat, the shrine was constructed exactly at the same period as Phra Pradaeng town and is much revered by local people. Phlaeng Faifa Fort (?????????????) – Part of the fort is in perfect condition and used to be a fort of Nakhon Khuean Khan, an old town fortified by several forts that was once a naval base on the Chao Phraya River estuary during the reign of King Rama I.
Wat Phaichayonphonsep Ratchaworawihan (???????????????????????????) – The temple contains a magnificent Phra Ubosot and Phra Wihan as well as a principal gilded stucco image of the Buddha Subduing Mara enshrined. Wat Prot Ket Chettharam (??????????????????) – It is the only Thai-buddhist temple in Phra Pradaeng as other temples within the area are Mon-buddhist. Wat Prot Ket was built by Phraya Phetphichai (Ket) during the reign of King Rama II in a Chinese architectural style, without the traditional Thai-style roof decorations. Wat Song Tham Worawihan (?????????????????) – The temple contains a large Mon-style chedi and a wihan built of brick and mortar with traditional teak roof decorations housing the Buddhas footprint. Si Nakhon Khuean Khan Public and Botanical Park (?????????????????????????????????????????) – It was established as a public park for recreational and exercise as well as for studying the ecological system of the local flora and fauna. Hua Chiao Chaloem Phra Kiat Museum (?????????????????????????????????) – It was constructed to provide assistance for fellow men and the university’s philosophy in sustaining arts and culture as well as doing research for public benefit. The museum exhibits various aspects of the Sino-Thai relationship from past to present. Nong Ngu Hao Farm and Tiger Farm (???????????????) – It began operation in 1986 and covers a total area of approximately 10 rai where various species of cobra are bred and venom extraction and snake catching are demonstrated. Wat Bang Phli Yai Nai (???????????????) – The temple was built to commemorate King Naresuan the Greats victory over the Burmese. Later, a large bronze Buddha image of the Sukhothai-style in the gesture of subduing Mara, with open eyes, was taken to be enshrined as the principal image of Phra Ubosot. The image became much revered by the people who call it Luangpho To. Wat Bang Phli Yai Klang (?????????????????) – The temple contains an immense reclining Buddha image of approximately 53 metres long known as Somdet Phra Sakayamuni Si Sumet Bophit. Bang Phli Cultural Centre, Bang Phli Rat Bamrung School (???????????????????????? ?????????????????????????) – The upstairs exhibits folk wisdom and cultural heritage that has been exchanged among people of different ethnic origins. The downstairs displays folkway models. Bang Pu Seaside (?????????????????) – Migratory seagulls flock to the seaside during November and April. Pak Lat (Phra Pradaeng) Songkran Festival (???????????????????????/?????????) – Every year on the first Sunday following Songkran Day (13 April), the people of Phra Pradaeng and district hold the Mon-style Songkran Festival, with the Nang Songkran procession, bird and fish release merit-making, as well as folk games and entertainment like Saba Game, Thayae Mon and Mon Ram. Song Khao Songkran Tradition (??????????????????????) – A Mon tradition of rice offering believed to have originated from the Songkran legend. One house in a village will be responsible for cooking plain rice which will then be soaked in jasmine-scented water to be served with savoury dishes like salted egg, fish, cabbage, and beef as well as various spicy salads, sweets, and fruits. All dishes will be put in banana leaf cups and arranged on a tray for young women to take to temples early in the morning. Phra Samut Chedi Fair (????????????????????????????) – An annual fair that attracts people from around the country to pay homage to Phra Samut Chedi for 9 days and nights, starting from the 5th day of the waning moon of the 11th lunar month. The main feature is a float contest of the procession of the red wrapping cloth for the Phra Samut Chedi around Pak Nam Market before changing to a boat procession along the Chao Phraya River to Phra Pradaeng District Office and back to the Phra Samut Chedi. Other activities include a candlelight procession around the Phra Samut Chedi, boat races on the Chao Phraya River, various forms of entertainment and booth displays of numerous products. Rap Bua or Yon Bua Festival (???????????????????????) – A tradition long inherited by the people of Bang Phli held annually on the 13th day of the waxing moon of the 11th lunar month and early next morning. The main feature is the respect paying and procession of the Luangpho To image both by land and water. The event features competitions of folk activities like lotus arrangement on a footed tray, boat contests, and folk entertainment such as Phleng Ruea or boat song. Early next morning will be the Rap Bua or Yon Bua tradition in which people will toss Dok Bua or lotus flowers onto the boat carrying the image of Luangpho To. Luangpho Pan Fair (????????????????????) – Bang Bos annual fair is held at Wat Mongkhon Khothawat around the 8th day of the waxing moon of the 12th lunar month in order to pay respect and remember the virtue of Luangpho Pan.